The Luddite planet of Gnish is not a pleasant world and it is doubly worse if you're a robot. Or someone who is responsible for creating robots. Or a member of the United Galactic Council. It is here that TIM-21, Dr. Quon and the rest of our heroes find themselves, with half our heroes scheduled for dismantling or questioning while the other half are thrown into the planet's famous battle pits, where robots are made to fight to the death! Dustin Nguyen continues to amaze with the artwork on this series. There is a certain simplicity to Nguyen's designs that is simply enchanting. Yet he also brings amazingly intricate levels of detail to the proceedings. 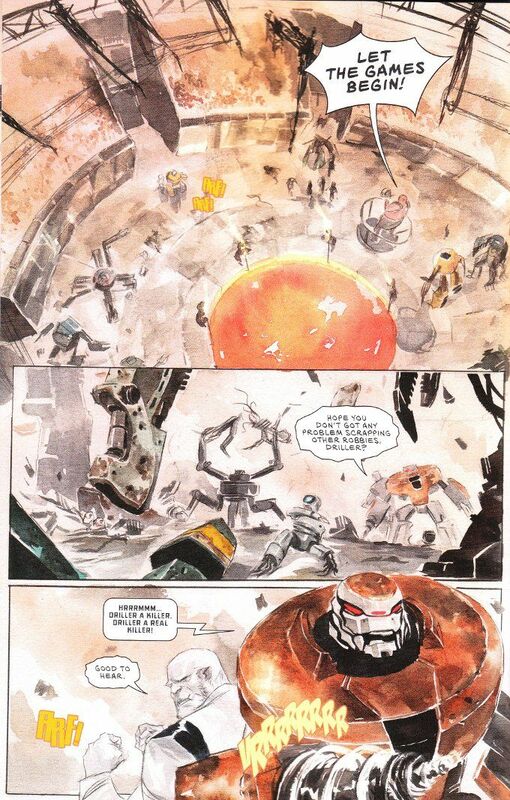 I cannot praise Jeff Lemire's skill as a writer enough. While the individual components of this story are Classic Science Fiction 101, Lemire somehow finds a way to make even the most solid of tropes seem brand new. Simple put, this is one of the best books on the market right now and a must read for all comic fans.